So many of our modern Christmas traditions hail from Germany (via England, thanks to Queen Victoria's German husband, Prince Albert); for a real injection of the spirit of Christmas, no better place to go than the source. Plus, Germans are nothing if not sticklers for authenticity – no plastic or made in China items. Only genuine evergreen branches, music, food, drink and shopping traditions allowed! 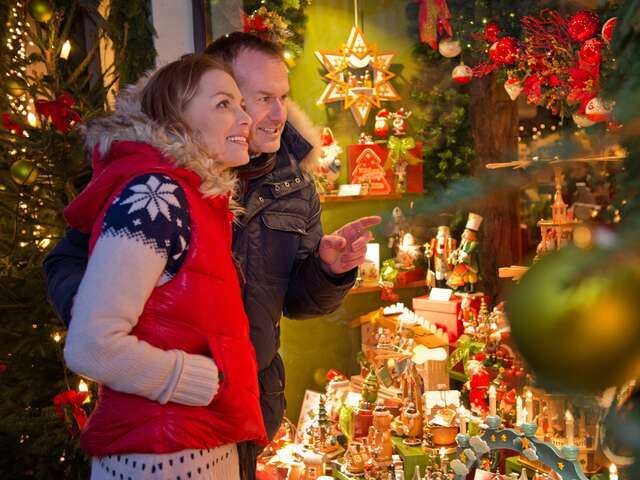 Lynn Elmhirst, BestTrip.TV's producer and host, shares her tips for visiting Germany's Christmas markets. 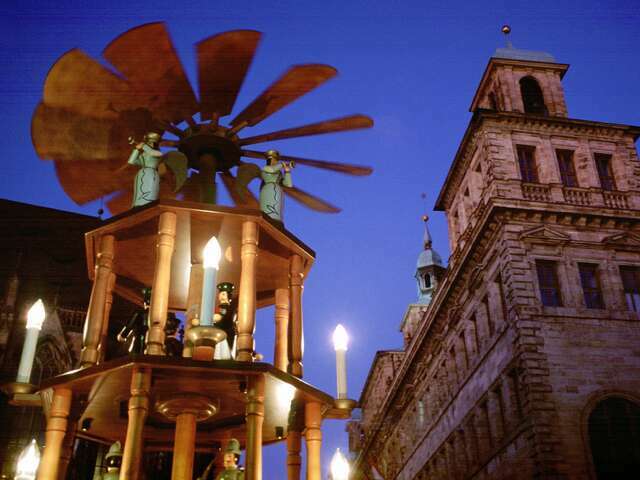 Markets are traditionally open during Advent, the last four weeks before Christmas, ending Christmas Eve, the day most Germans celebrate. This year, Advent begins Sunday, November 27th; many opening ceremonies are the Friday before the first Sunday. One more tip about when to go: for an extra special experience, visit in the evening – when twinkling lights, bonfires and torches kindle the magic and spirit of the season and transport you back to the ancient origins of this winter festival. 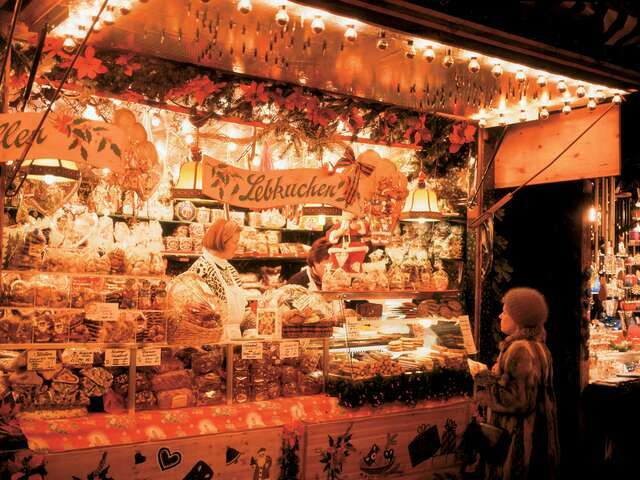 What to eat and drink:The fir branch-draped, traditional wood stalls include the best German standards: hot sausages, pretzels, and beer, plus the seasonal delights: hot, mulled 'gluhwein'; stollen, a particularly addictive fruit bread; gingerbread or lebkuchen. And marzipan, oh, the glorious marzipan. Forget the icky, stick-to-the-roof-of-your-mouth goo slathered on top of cheap fruitcakes here at home. Once you taste the real thing, you just can't get enough. Marzipan in Germany isn't just for cake topping. It comes formed in all shapes. Look for the quirky Christmas traditional 'marzipan kartoffeln' – marzipan 'potatoes', little marzipan balls dusted with coco to look like… miniature potatoes. Other shapes are delightful, hand painted confections – a favorite in southern Germany is little pigs, a symbol of good luck. Take some home for gifts! I would love forever anyone who put marzipan kartoffeln in my stocking! 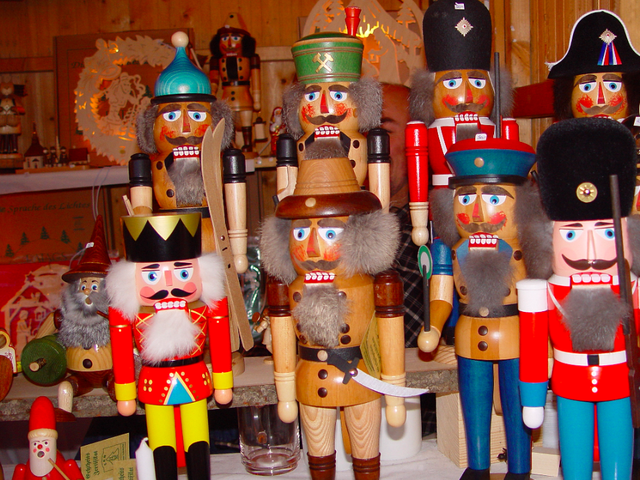 What to buy:Markets are laden with high quality, and often, artisan-crafted German Christmas traditional items like nutcrackers, ornaments, religious items and toys, toys, toys. You are going to want to buy the unparalleled handmade glass ornaments and you are going to spend a lot of time trying to figure out how and if you can get them home safely. Sheepskin slippers and mittens, and lots of boiled wool. I admit to an obsession with boiled wool, a northern European tradition I can indulge easily at Germany's Christmas markets, buying myself and loved ones hats, mittens, vests, jackets and more with a European design flair you don't find at home. Every market also has local specialties like the iconic blue and white china in Dresden, in everyday and Christmas designs. 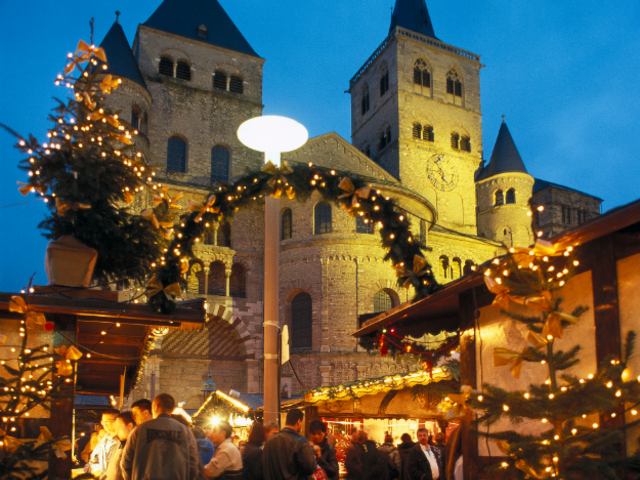 How to get there:Any trip to Germany during Advent and up to Christmas Eve gives you the opportunity to visit the local Christmas market. 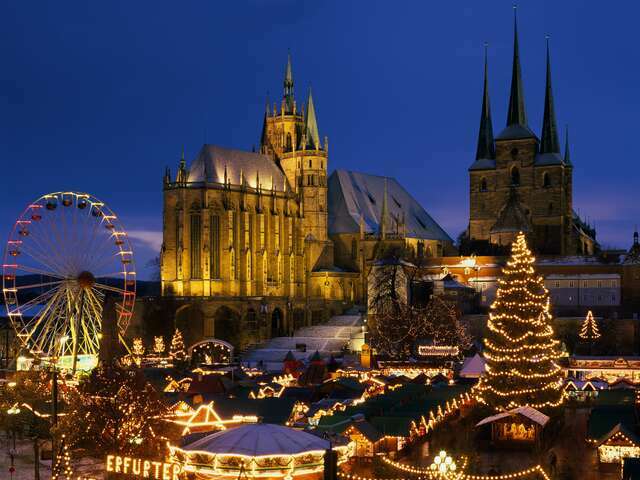 Land tour companies and river cruise companies offer Christmas market specialty tours this time of year that take you to multiple Christmas markets so you can compare the atmosphere, food and shopping. 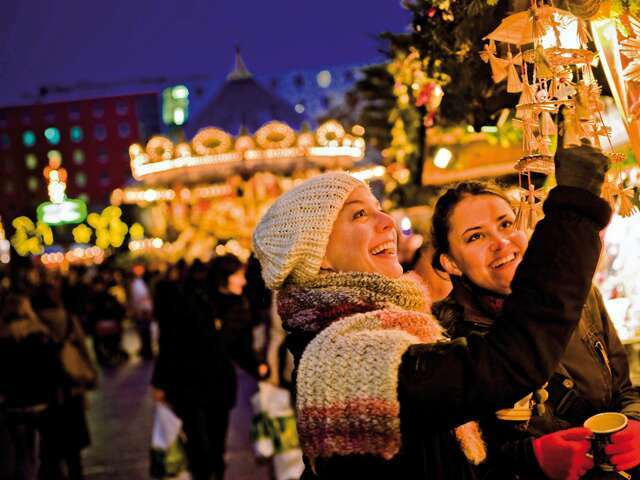 A Christmas market cruise on the Danube, for example, could include flying into Frankfurt and visiting its market before your cruise, and sailing to both Nuremburg's (possibly the most famous) town square market and Regensburg, in the castle grounds. 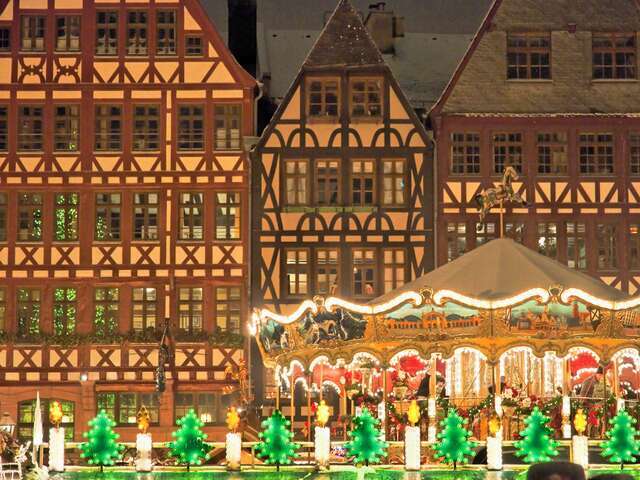 Even 'grinches' discover genuine Christmas good cheer in the historic, traditional atmosphere of Germany's Christmas markets. And lovers of the season add to cherished memories of Christmas celebrations.